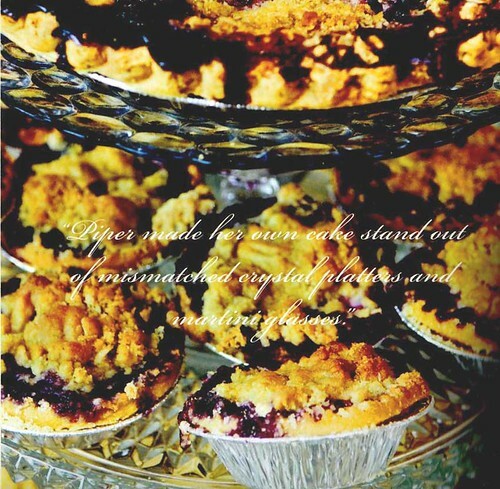 I was going thumbing through the Spring/Summer 2009 issue of wellwed cape and stopped in my tracks over this incredible pie display made by a bride none other than Piper, which happens to be my maiden name. It's quite often we have weddings that feature creative dessert bars either in lieu of their wedding cake or in addition to them. Just this year alone we have had two clients mention pies, which I love. I mean, who doesn't love a warm and gushy piece of pie, especially a la mode?? ?Perfect for an event at home! This Piper masterminded her own stacked tiers with vintage plates and martini glasses. Talk about being thrify! I think both Martha Stew & little Jack Corner would have been proud :).